In economics and accounting, a good is a product that can be used to satisfy some desire or need. More narrowly but commonly, a good is a tangible physical product that can be contrasted with a service which is intangible. As such, it is capable of being delivered to a purchaser and involves the transfer of ownership from seller to customer. For example, an apple is a tangible good, as opposed to a haircut, which is an (intangible) service. One usage that preserves the distinction between goods and services by including both is commodity. In microeconomics, a 'good' is often used in this inclusive sense of the word (Milgate, 1987). A good is any object that increases the utility of the consumer/ product directly or indirectly. Goods are usually modeled as having diminishing marginal utility. Some things are useful, but not scarce enough to have monetary value, such as the Earth's atmosphere, these are referred to as 'free goods'. In economics, a bad is the opposite of a good. Ultimately, whether an object is a good or a bad depends on each individual consumer and therefore, it is important to realize that not all goods are good all the time and not all goods are goods to all people. Goods can be defined in a variety of ways, depending on a number a characteristics as listed below. Goods and services have price elasticity. An elastic good is one for which there is a substitute good; for example, as pen prices rise, the cross elasticity of demand would result in consumers buying more pencils instead. 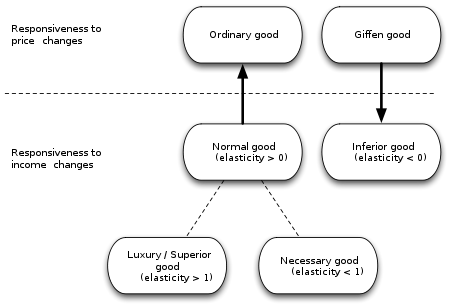 An inelastic good is one for which there are few or no substitutes, such as tickets to major sporting events or original works by famous artists. This page was last modified on 15 April 2011 at 13:19.